For a truly unique vacation experience, escape to Hilton’s Los Cabos Beach & Golf Resort paradise — a Four Diamond hotel with world-class amenities, award-winning service and unparalleled accommodations. Ideally situated off the Cabo Corridor, on a choice inlet boasting one of the few swim-safe beaches along southern Baja’s coastline, you can splash in the spectacular Sea of Cortez, dive into the opulent Infinity Edge pool, or explore Hilton’s beautifully maintained tropical gardens. Relax and refresh with attentive poolside bar service, and dine on delicious and decadent cuisine in one of six excellent restaurants, or in the comfort of your own room. 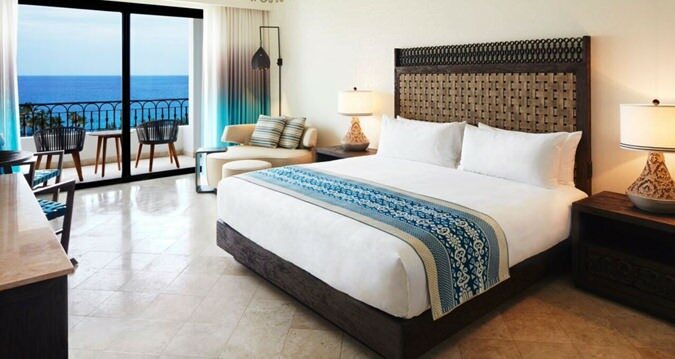 At Hilton Los Cabos, the perfect vacation is whatever you want it to be. The Hilton Resort is located on Baja’s Transpeninsular Carretera, or what locals refer to as the Cabo Corridor. Equa-distant from both Cabo San Lucas and San Jose del Cabo, it’s a 10 to 15 minute drive by taxi or private car, and easy access to both historical towns. A great place to stay if you want to explore the night life and natural landmarks of San Lucas, and the more culturally rich town of San Jose. The resort is part of the Hilton family of high end / high class resorts, homes to celebrities, and the ultimate in vacation experiences. The brand new Hilton Los Cabos Beach & Golf Resort more than lives up to Hilton’s famous reputation. Room rates include accommodations only (European Plan). But, with six beautiful restaurants to choose from on the property, bars around every corner, and accommodating Room Service, you won’t go home hungry! This vacation will be amazing and memorable. If you decide to explore further afield to either San Lucas or San Jose, just ask your LuxLife Vacations Concierge for amazing restaurant options in either area to fit your mood, appetite, style and budget. The Hilton is situated on the most beautiful white sand beach bay protected by a breakwater, where you can swim, snorkel and enjoy a multitude of water activities. Many other Los Cabos resorts have no access to swimmable beaches, due to rough seas and strong undertow. So if you’re a beach lover, and ocean swimmer, the Hilton is the place to be! Enjoy breath-taking vistas and sea-breezes from your private balcony, with partial Sea of Cortez view, off this stylish room. 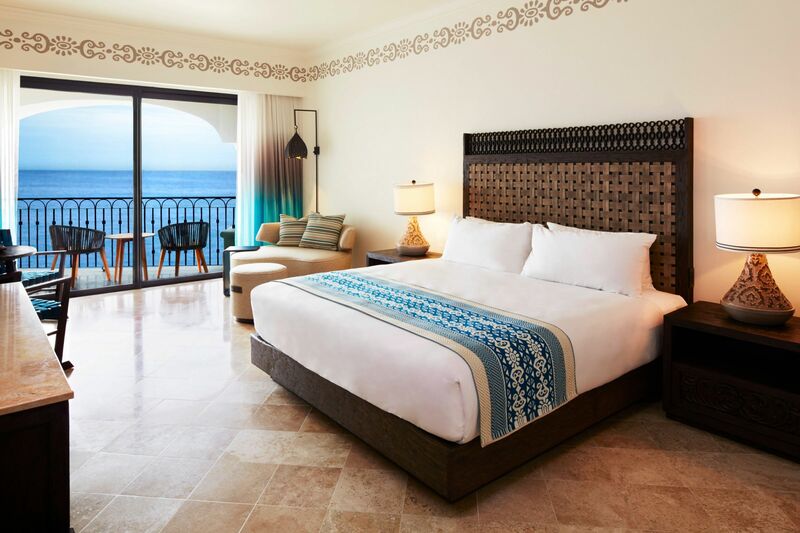 Mexican culture is reflected in the beautiful carved wood furnishings, custom wall stencils, and rich textiles, with king bed, and comfortable seating area. Amenities include WiFi, HDTV with on-demand movies, and in-room guest interactive menu to book activities and room service. Special touches include daily turndown service, complimentary mineral water, bathrobes and slippers. Enjoy expansive, breath-taking vistas and sea-breezes off the Sea of Cortez, from your private balcony off this stylish room. Mexican culture is reflected in the beautiful carved wood furnishings, custom wall stencils, and rich textiles, with king bed, and comfortable seating area. 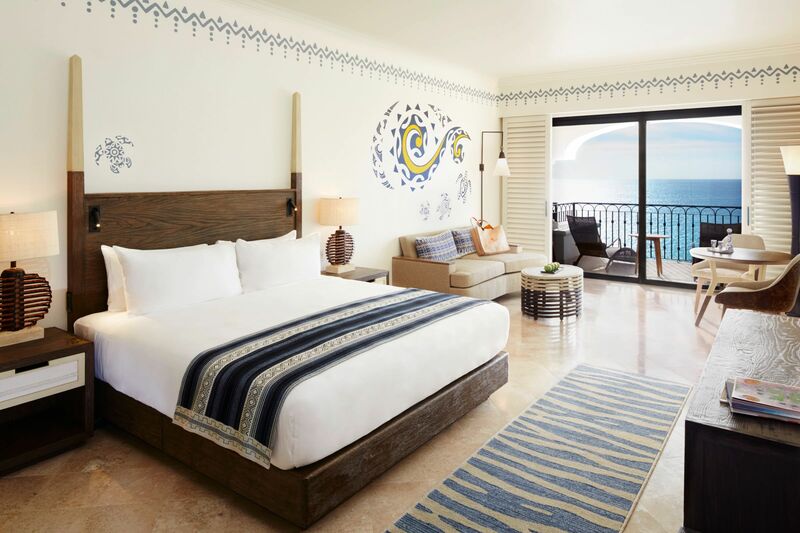 Enjoy expansive, breath-taking vistas and sea-breezes off the Sea of Cortez, from your private balcony off this stylish and spacious junior suite. This suite boasts a king bed, living area, and full bath, complete with bathtub and dressing area. Mexican culture is reflected in the beautiful carved wood furnishings, custom wall stencils, and rich textiles. Enjoy expansive, breath-taking vistas and sea-breezes off the Sea of Cortez, from your private balcony off this stylish Superior junior suite. This suite boasts a king bed, larger living area, and full bath, complete with bathtub and dressing area. Mexican culture is reflected in the beautiful carved wood furnishings, custom wall stencils, and rich textiles. Located in the Vista wing, Hilton’s elegant ‘hotel-within-a-hotel’, The Vista king room boasts unique styling including a balcony, charming shutters, leather and wood furniture, and hand-painted details. Enjoy stunning Sea of Cortez views and sea-breezes as well as exclusive access to La Vista Lounge throughout your stay. Amenities include WiFi, HDTV with on-demand movies, and an in-room guest interactive menu to book activities and room service. Special touches include daily turndown service, complimentary mineral water, silk robes and slippers. This room has one king bed and a seating area. Located in the Vista wing, Hilton’s elegant ‘hotel-within-a-hotel’, the Vista junior suite boasts unique styling including a balcony, charming shutters, leather and wood furniture, and hand-painted details. Enjoy stunning Sea of Cortez views and sea-breezes, as well as exclusive access to La Vista Lounge throughout your stay. Offering more space, the suite boasts a king bed with a dressing area, a living area, and a full bath. Amenities include WiFi, HDTV with on-demand movies, and an in-room guest interactive menu to book activities and room service. Special touches include daily turndown service, complimentary mineral water, silk robes and slippers. For the ultimate experience, treat yourself to this beautiful suite, boasting magnificent views of the Sea of Cortez from the spacious terrace and double balcony. It features a separate living room, with sofa bed, and additional bathroom, as well as the private bedroom with king bed, dressing and bathroom areas, featuring a hydro-massage tub to help you relax. The Premier suite Amenities include a mini-refrigerator, two 48-inch HDTVs, WiFi, in-room guest interactive menu, and extra storage space. 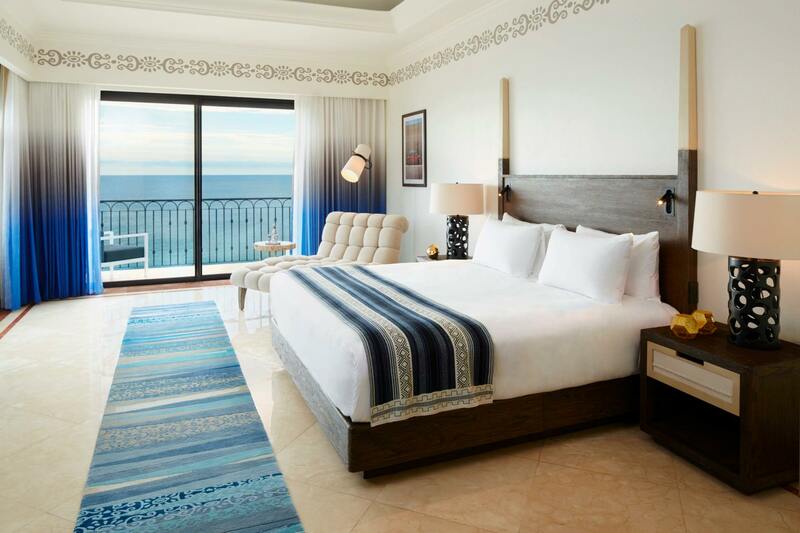 Located in the Vista wing, Hilton’s elegant ‘hotel within a hotel’, the Vista premier one-bedroom suite features a comfortable terrace from which to enjoy stunning Sea of Cortez vistas and sea-breezes. The Mexican flavored design includes charming shutters, leather and wood furniture, and hand-painted details. The Vista premier suite boasts a separate living room, with additional half bath, and private bedroom with king bed, dressing and bathroom areas. Other amenities include a mini-refrigerator, two 48-inch HDTVs, WiFi, in-room guest interactive menu, and extra storage space. as well as exclusive access to La Vista Lounge throughout your stay. Special touches include daily turndown service, complimentary mineral water, silk robes and slippers. Located in the Vista wing, Hilton’s elegant ‘hotel within a hotel’, the Governor Suite boasts unique styling, including a balcony, charming shutters, leather and wood furniture, and hand-painted details. Enjoy outstanding views of the sea and exclusive access to La Vista Lounge throughout your stay. Boasting plenty of space, the suite offers a king bedroom, with walk-in closet and bathroom, a separate living room with an additional bathroom, and a spacious terrace. The main bathroom features a whirlpool tub to help you relax. Amenities include a mini-refrigerator, two large HDTVs, WiFi, in-room guest interactive menu, and extra storage space. The ultimate choice for an unforgettable stay in Los Cabos, the Vista Presidential Suite is set within Hilton’s exclusive Vista wing, a ‘hotel within a hotel’. 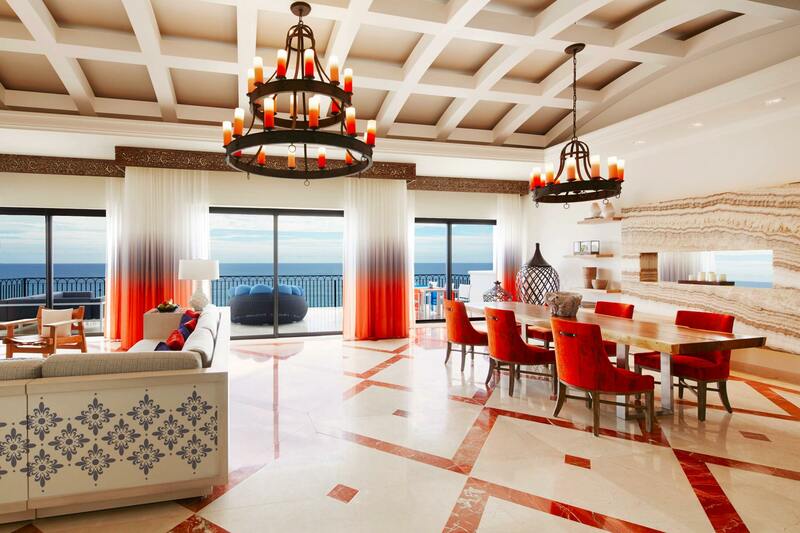 Unwind in the spacious living room, dining room, and kitchen, all furnished to the highest standard with unique Mexican-inspired décor; or host an event on your private terrace, with marvellous views of the Sea of Cortez. The suite also includes a half bath off living area; a spacious master bedroom, with king bed, dressing room, and bathroom with whirlpool tub. The second bedroom offers two queen beds and ensuite bathroom. Enjoy access to the exclusive Vista Lounge throughout your stay. Other amenities include three large HDTVs, WiFi, and an in-room guest interactive menu. Special touches include daily turndown service, complimentary mineral water, silk robes and slippers. The Hilton Resort is located on Baja’s Transpeninsular Carretera, or what locals refer to as the Cabo Corridor. Equa-distant from both Cabo San Lucas and San Jose del Cabo, it’s an easy 10 to 15 minute drive by taxi or private car to access either historical town. A great place to stay if you want to explore the night life and natural landmarks of San Lucas, along with the more culturally rich town of San Jose with its Historic Art District, Estuary, and Organic Farms. Hilton provides five restaurants on-site, offering a wide variety of choices for guests. Enjoy a welcome cocktail at Azul sub-zero tequila bar in the lobby. Check out El Meson for their Breakfast buffet, casual lunches and dinners featuring a Mexican, American and International menu. Swing into Mio for a healthy juice or snack poolside, or experience the comfort food and swim up bar at Madero. Treat yourself to a delightful Mexican/Italian fusion dinner at Vela, al fresco by the pool, or indoors. The Hilton wants you to relax on your vacation, and Eforea Spa offers guests the ultimate in pampering treatments. Utilizing indigenous herbs and plants in local and international treatments, guests can customize their treatments with ingredients from the Living Wall. A specialized Cabo Kids area at Eforea offers children and their parents spa packages, or specialized kid’s treatments. In addition to the spa, guests are invited to explore the Wellness Path, to the Zen Garden and Movement studio. Everyone is welcome at the Hilton, including children & pets. Extra person charges may apply if more than two people are sharing a room. Some conditions apply. Cribs, High-chairs and children’s menus available. Service support animals welcomed. Wheelchair accessible rooms, elevators, parking and meeting rooms, and Braille elevator and room numbers. Hilton’s Los Cabos Beach & Golf Resort is a golfer’s paradise. The challenging professionally designed courses will keep you on your toes, as you take in breathtaking views of the Sea of Cortez, and Baja’s incredible desert vistas. After your day on the links you can have all your kinks massaged out at Eforea spa, soak in the Jacuzzi or swim, and wind up the day with a great dinner, al fresco on the terrace, on the beach or in the privacy of your suite. Maximum 2 adults allowed per room. 3rd and 4th** person over 18 years of age: $65 + tax per person, per night. Rollaway beds are available upon request, subject to availability. **A 4th adult guest will be allowed, only in a double queen size room, governor or presidential suite. FAMILY PLAN: Up to 2 children (18 years and under) stay free when occupying a king room, double room or any suite. Rollaway beds are available upon request and subject to availability. where an original name is crossed out and a substitute name is added.